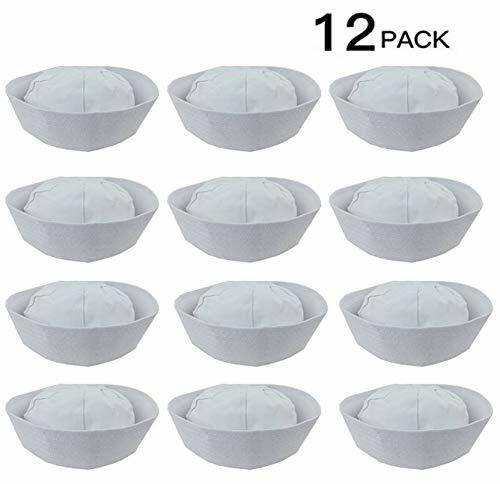 Add a touch of elegance with these Top Hats. 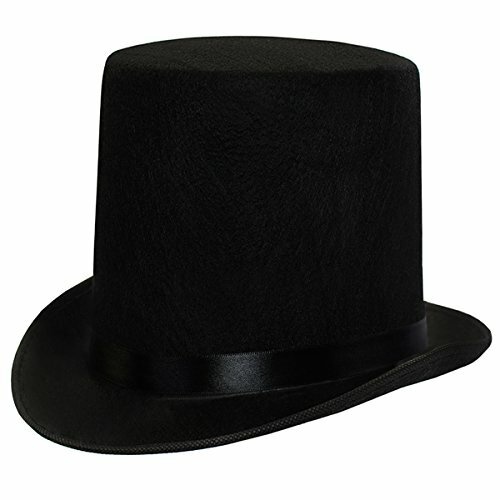 This modern color of the formal top hat is perfect for Weddings, prom, and costume events. 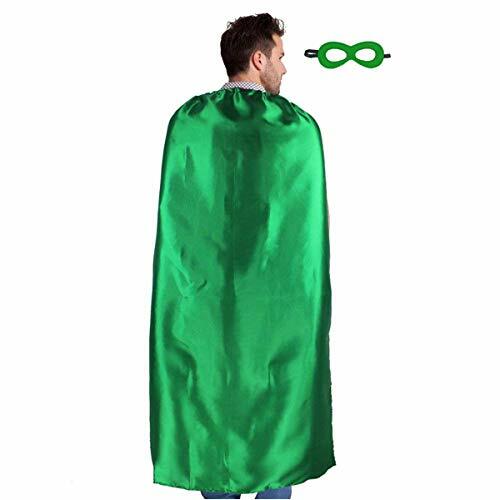 This green superhero cape is all you need to become your very own superhero. 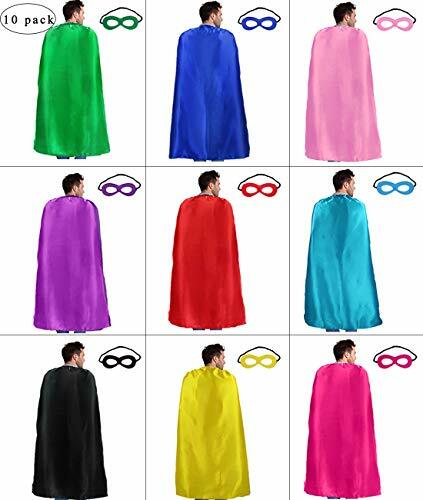 This cape is a great accessory for any superhero costume. Every adult also dream to be a Super Hero with super power to face the difficult in life. Our Superhero Capes for adults can help you come it true.PERFECT SUPERHERO THEME PARTY PROP: Every generation has had it's own set of heroes: from classics to reboots. Enjoy reliving all the memorable moments. Provide the party anyone would have wanted as a kid. Our red black blue adults superhero capes and masks set the theme while still giving ample room to your attendees imagination. BEST CHOICES ✅ Team Building ✅ Commercial activities ✅ Charity Event ✅ Charity Event ✅ Bachelor Party ✅ Wedding Care Instruction: ✅ For the best look possible, all capes should be ironed on VERY LOW heat before use. Capes should be hand washed in cold water and air dried. 100% SATISFACTION GUARANTEE: ✅ We aim for 100% customer satisfaction. If there are any problems with the product please let us know. We provide easy refund possibilities and timely shipping. Click Add to cart now! 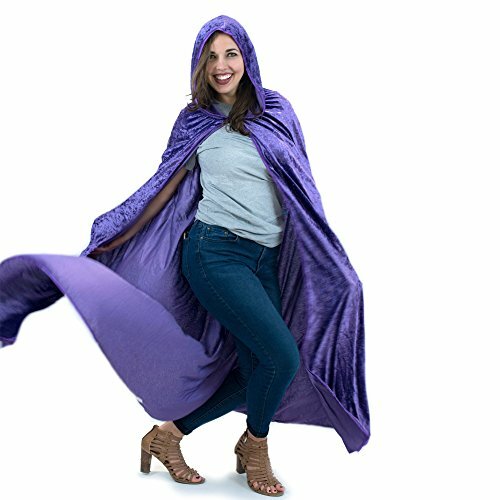 These hooded cloak capes are the perfect costume accessory for any cosplay fan looking to fill out a princess, wizard or Red Riding Hood costume. They are available in black, red, or any of our 14 vibrant colors. Each hooded cloak has a 100% polyester velour (56" long) with attached hood. Storybook Costume for Kids and Adults. 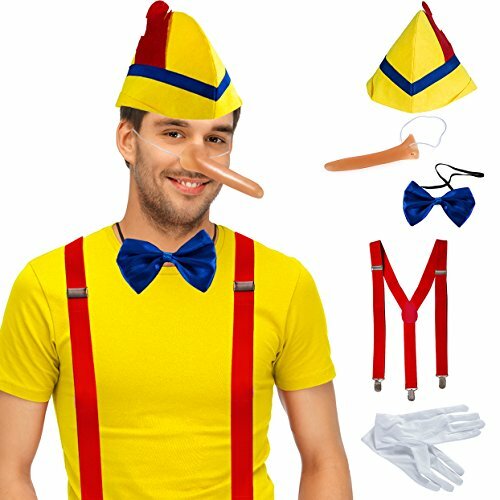 Five piece set includes long nose, hat, suspenders, gloves, and bow tie. Dress up this Halloween as your favorite storybook character! Excellent for school plays and theatrical performances as well. 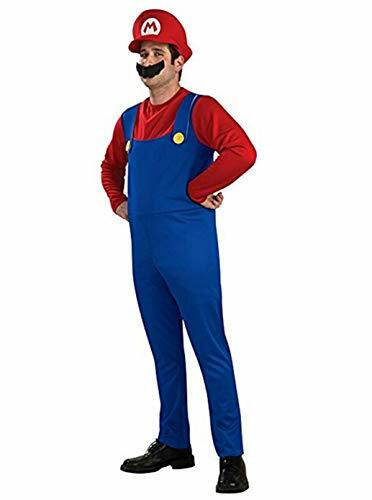 Super Mario Costume Luigi Brothers Deluxe Kids Cosplay Mens Adult Dress Up Party Costume What's in the Package: 1 * jumpsuit 1 * hat 1 * mustache Size Chart: Kids Size: X-Small:for about 90-100cm height children. Small: for about 115-125cm height children. Medium: for about 125-135cm height children. Large: for about 135-145cm height children. Adult Size: Small: for about 155-165cm height teen. Medium: for about 165-175cm height adult. Large: for about 175-185cm height adult. Precautions: 1.Due to manual measurement, please allows 1-3(cm) deviation. 2.The real color of the item may be slightly different from the pictures shown on website caused by many factors such as brightness of your monitor and light brightness. Services: If you have any question or demands,please don't hesitate to contact us,we are glad to reply you within 24 hours. Layers of 100% polyester tulle in St. Patrick's Day colors. Hand wash, lay flat to dry. Satin covered elastic waist. M WAIST: 16" unstretched to 30" fully stretched. M LENGTH: 11-12". Best for children 3-8+ depending on child's size. L WAIST: 20" unstretched to 36" fully stretched. L LENGTH: 15". XL WAIST: 28" unstretched to 44" fully stretched. XL LENGTH: 15". Best for adults size 12+. Hand wash cold, lay flat to dry. So Sydney brand. You don't have to wait for a full moon to transform into a beast. For Halloween, you can howl at the moon when you wear a Brown Werewolf Costume that fits adults up to 200 lbs. It includes a torn shirt, a plush mask and gloves. Both the mask and gloves are covered in fluffy brown fake fur. The shirt in this werewolf adult costume includes a furry chest piece and tattered red plaid shirt, so you can look like you've torn through your human clothes during your transformation. 3 Layers - 100% polyester tulle, hand wash, lay flat to dry. Satin covered elastic waist. M WAIST: 16" unstretched to 30" fully stretched. M LENGTH: 11-12". Best for children 3-8+ depending on child's size. L WAIST: 20" unstretched to 36" fully stretched. L LENGTH: 15". XL WAIST: 28" unstretched to 44" fully stretched. XL LENGTH: 15". Best for adults size 12+. Hand wash cold, lay flat to dry. So Sydney brand. You will bee the buzz of the party in this flirty bee costume. Just don't sting anyone! Features embroidery trim dress, headband and single-sided wings. 3 layers of supersoft and fluffy 100% polyester tulle. Hand wash, lay flat to dry. Satin covered elastic waist. M WAIST: 16" unstretched to 30" fully stretched. M LENGTH: 11-12". Best for children 3-8+ depending on child's size. L WAIST: 20" unstretched to 36" fully stretched. L LENGTH: 15". Best for larger kids, teens, and adults to size 10. XL WAIST: 28" unstretched to 44" fully stretched. XL LENGTH: 15". Best for adults size 12+. Hand wash cold, lay flat to dry. So Sydney brand. Make a statement at your next event with the Black Flirty Top Costume. In addition to offering a cute choice for Halloween, this item works well for character reenactments, parties, parades and other holiday productions and festivities. Its composite fabric features polyester for durability and spandex to create a comfortable, easy fit. Lingerie-style details on this women's costume include a faux lace-up front and lacy puffed cap sleeves. Pixie (angle) cut layers of 100% polyester tulle in 2 colors. Hand wash, lay flat to dry. Satin covered elastic waist. M WAIST: 16" unstretched to 30" fully stretched. M LENGTH: 11-12". Best for children 3-8+ depending on child's size. L WAIST: 20" unstretched to 36" fully stretched. L LENGTH: 15". XL WAIST: 28" unstretched to 44" fully stretched. XL LENGTH: 15". Best for adults size 12+. Hand wash cold, lay flat to dry. So Sydney brand. Convenience in a costume. Hey men get your jacket costume. Cover whatever you are wearing and you will be dressed for the part. 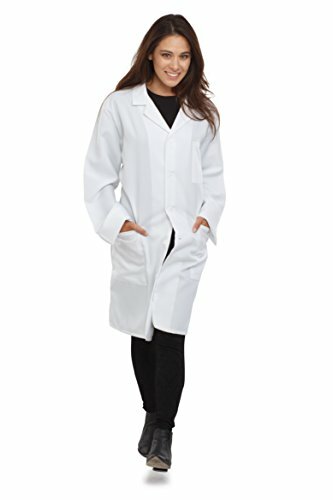 One size fits most, jacket chest size measures 44 inch and jacket length is 29 inch. Check out our other ez styles such as royal prince, noble king, doctor, mike mechanic, fire fighter, swat team and pilot.